How To Find Last Query Executed On The Oracle Form | Oracle Forms Interview Questions. 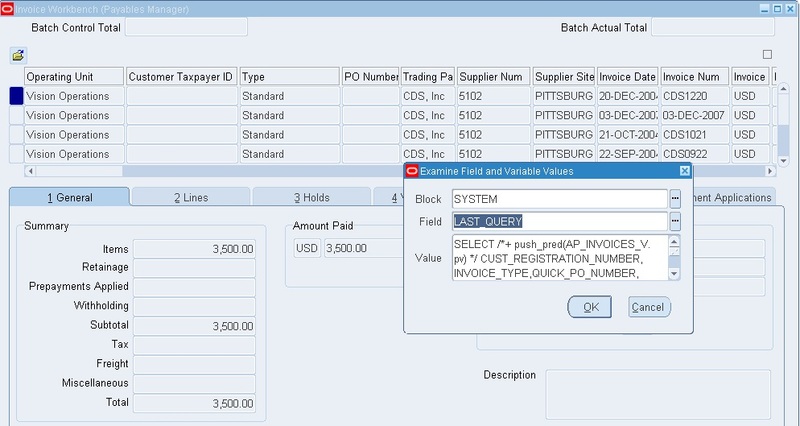 Consider a real time example where we have Queried/Searched something on the Oracle form and data is displayed. If you are curious to find database query executed behind this search then this article explains the steps to find the same. Imagine i want to list the invoices for Trading Partner 'CDS, Inc' from the application. Value field displays the Query for you. Copy the query and executed in TOAD/Sql Plus etc to see the same data! Oracle Apps Guy: How To Find Last Query Executed On The Oracle Form | Oracle Forms Interview Questions.